Konad and Glitter Abuse: Greg Wallace Would Say Cor! Today I will be mostly wearing Orly Halleys Comet, which is a delightful shade of green / blue / turquoise / teal / thereabouts. If Greg Wallace were to describe this colour, he would probably say it was "cor!" then realise that this nail polish isn't a pudding and shut up. What's better. Pudding or Polish? Lovely, it is. The gold duochrome doesn''t really show up all that much, but that may be due to the miserable, rainy day we're having. 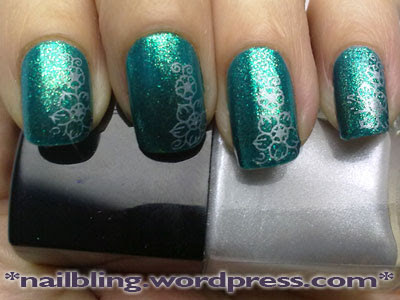 Got a bit fidgety a bit later on and Konaderised it with some silver flowers, using Konad plate m36 and MUA Shade 11.